We live on Kwajalein Island, part of a small U.S. military installation on Kwajalein Atoll, Republic of the Marshall Islands. The atoll consists of about 100 small islands. Our island is the largest in the atoll at about 3 miles by ½ mile in size. It currently houses about 2,500 residents. We are mid-80s in temperature most of the time, with a strong, midday sun (being 700 miles or so from the equator) and high humidity all of the time. You can ride your bike here at a slow pace at 3 AM and still break out in a sweat. The sun is intense, so we try to avoid it as best we can between about 11 AM and 3:30 PM, which are the hours that some stores (such as they are) shut down anyway. 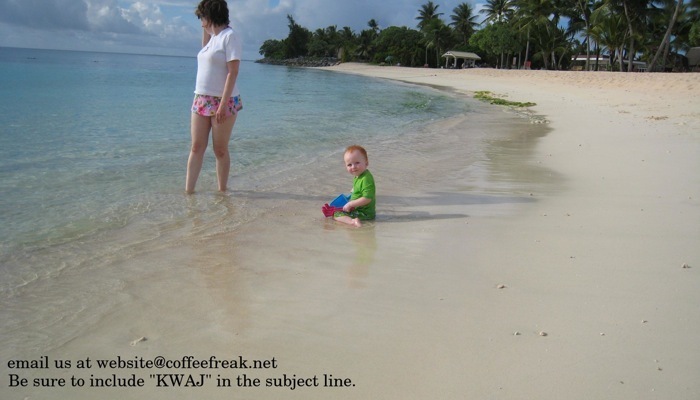 So, you ask, how has our life massively changed and how is it different since arriving to Kwajalein on August 7, 2007? -Starbucks and Wal-mart for the Sunrise Cafe and Um......okay, so here is where it all goes very wrong...nothing comes close to Wal-mart, but you get the idea. :) The Sunrise Cafe does make a mean cinnamon roll, however. We are trying to put a little bit of everything on here, as you all may have varied interests in this funky, faraway place where we are living. There are tons of pictures of the kids for the grandparents, aunties, and uncles, and hopefully there are plenty of fun facts of our life here on Kwajalein. Obviously this is a developing story, and only 5 weeks of it have really unfolded before us so far, but it is a story of a dream Mark and I have had for a long time to take our family somewhere “different” for a few years. I think we hit the mother lode on “different”! For us personally, it is also a story of how God's hand moves in our lives and the story of much answered prayer before we ever even got here. Some of you know that story, and some of you can ask if it interests you, but the best part of the whole deal, no matter where any of us are on this planet, is that the Lord hears when you call out to Him. That is part of our story, and it is interwoven throughout all that we plan to continue to share about the latest adventure He has taken us on. It is a story of daily frustration and personal “stretching” and growth (like when the bike falls over full of groceries for the 10th time, or the sky opens up and dumps buckets of rain on our heads with no warning mid-ride home). It is one of conquering fears (like the kids swimming and being around tropical aquatic life) and trying new things like snorkeling and scuba diving. It is about the small joys of a new discovery or the delight of watching the hermit crabs scuttle across the beach at dusk. It is about tears of missing loved ones but the beautiful experience of building new relationships in such a unique time of life. It is about the simple things. And it is about the prayers of 3 small children on their knees 5 months ago when we told them of this new plan and we all asked God together to give us what we needed to get here, do this, be safe, be healthy, be brave, and embrace this new life! It is about His provision, because we know that every good and perfect gift comes from our Father above. It is about following His still small voice all the way around the world, and it is about knowing He is very much here.